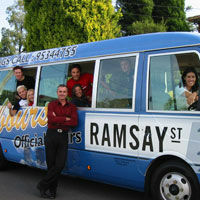 One of the most popular Melbourne tours is Ramsay Street featured in the television series Neighbours. From the television series Neighbours, Ramsay Street real street name Pinoak Court is in the suburb of Vermont South which is 29 kilometres from Melbourne CBD. Everybody needs good neighbours! Welcome to Ramsay Street, where the dramas unfold every day on the set of Australia's long-running soap opera, 'Neighbours.' On this official tour, see the actual houses and the street that provide the backdrop of this internationally loved Aussie television show, and meet one of the cast members. Beloved by many, not just in Australia but across more than 50 countries including the UK, where it is especially adored, Neighbours is Australia's longest-running television soap opera, entertaining fans with drama and heartache since 1985. This is the Aussie show that launched the career of many a star, most notably Kylie Minogue, and is sure to bring back memories of the early days of the Robinson and Ramsay families. See where it all began on fictional Ramsay Street, tucked away in the suburbs of Melbourne. This is the street where the residents of Neighbours live. The TV families may have changed over the seasons, but the exteriors of the houses remain the same. Take exclusive photos and grab an autograph or two from one of the past or present cast members. If you still want more, upgrade to the Ultimate Fan Tour, where you'll go inside Global Television Studios to the exterior sets of the Lassiter's Complex, including the lake, Carpenter Mechanics, Charlie's Bar and Harold's Store. This is a great day out, and your professional guide will let you in on all the gossip, insider information and tricks of the trade in filming Neighbours. The best way of seeing the real Ramsay Street is on the Official Neighbours Tour. 3 hour tours depart Monday to Friday at approximately 10am.